Hyderabadi Baingan: Hyderabadi baingan is a traditional recipe straight from the royal kitchens of Hyderabad. Small whole eggplants are doused in nutty gravy made with peanuts, tamarind and sesame seeds to make traditional Hyderabadi baingan. Hyderabadi baingan is a very popular accompaniment along with Hyderabadi Vegetable Biryani. Slit the eggplants into quarters without removing the stem. Make a mixture with salt, turmeric powder and paprika powder. Rub the mixture in between the sections of the quartered eggplants. Heat 2 tbsp or more oil in a pan and shallow roast the eggplants until tender, cooked and browned. Dry roast peanuts, white sesame seeds, grated coconut and cumin seeds separately, each for at least 2 minutes. Keep aside to cool them to the room temperature. Grind the dry roasted ingredients along with 1 sprig curry leaves, poppy seeds, onions, coriander leaves, dried coriander seeds and dried red chilli along with few drops of water to make a masala paste. Heat the remaining oil in a pan, on medium flame. Add in cumin seeds, rest of the curry leaves, mustard seeds and onion seeds and let them splutter. Add in the ginger garlic paste and sauté for few seconds. Add in the grinded paste and cook till it starts leaving the sides of the pan. Add in tamarind paste and grated jaggery. Cook for few minutes to let the jiggery dissolve. Add the fried eggplants and mix well. Cook for at least 5-10 min on low flame and then remove from heat. Hyderabadi baingan is ready to be served. Serve hot Hyderabadi baingan with Hyderabadi vegetable pulav or tandoori naan. 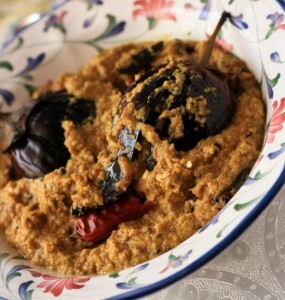 If you have any queries regarding the Hyderabadi Baingan recipe, please leave a comment.